We are just getting organised and then will head out for dinner. Tomorrow we are off to Moreton Island for a day trip so hopefully that will be fun if the weather is nice, they have had a heatwave here but apparently rain is forecast for tomorrow, typical. The day after it is Australia Zoo, home of the late Steve Irwin, really looking forward to that. The Red Centre was quite an adventure, check out the photos. 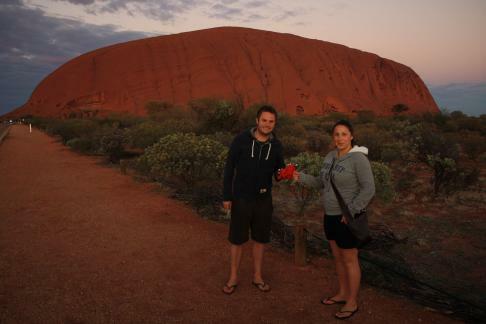 We tried kangaroo and camel, we slept under the stars, we saw the sunrise at Uluru (Ayres Rock to the uninformed! ), we had a schooner at Boojangles and we drove a long way, everything is so spread out. Alice Springs was alright but we were quite happy to leave, imagine a smaller version of Crawley in the middle of the desert! Uluru was definitely worth a visit, it is huge and an awesome sight.